Agera Rx Ultra Mild Cleanser is specially formulated with mild surfactants and leaves the skin feeling clean and refreshed. Ph adjusted and fragrance free with a light foaming action. Cleanses without irritation or abrasion and suitable for all including sensitive skins. This product is "tearless" and ideal for daily use. Paraben free. This antioxidant serum helps to restore a younger more youthful skin with improved collagen and elastin production. Magnesium Ascorbyl Phosphate is a stable high dose vitamin C molecule in a ph neutral formulation. Vitamin C has been shown to enhance collagen production and is a potent antioxidant protecting the skin from free radical damage. An Agera® Rx growth factor peptide complex enhances the production of collagen and elastin. A leucocyte extract helps to suppress unwanted pigmentation. Suitable for all skin types. 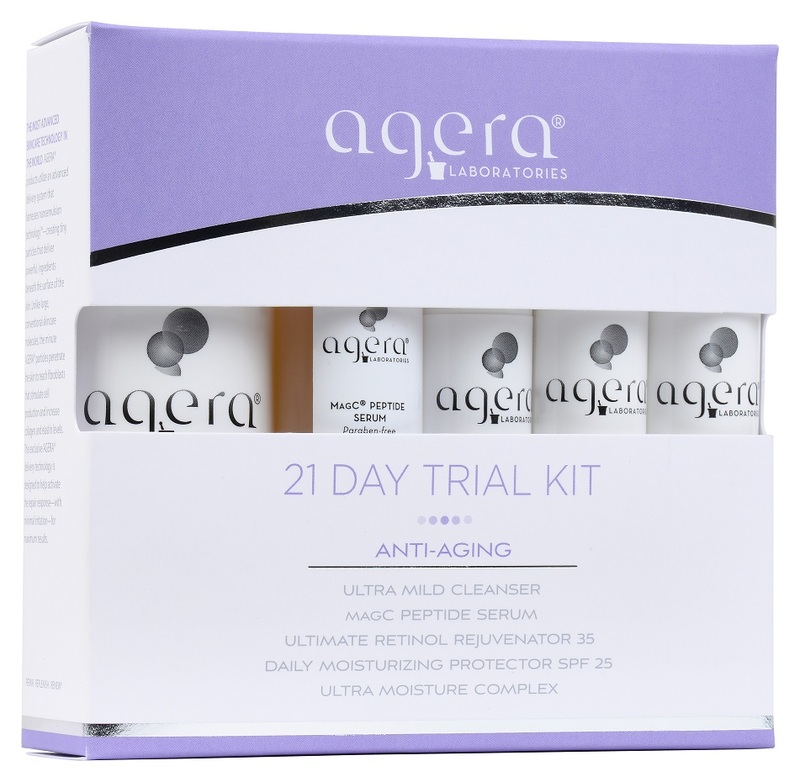 This Agera® Rx moisturiser is rich in ceramides that give resilience and help reduce fine lines and wrinkles. Specially formulated to contain high levels of Antioxidants - Vitamin A, C and E to prevent free radical damage while providing a powerful moisturiser to improve texture and tone. Stabalised Vitamin C in the form of MagC Phosphate provides a positive effect on reversing the degradative effects of ageing. A specially formulated satin smooth moisturiser, once applied, is invisible to the eye. It has a multiple function formula that hydrates while maintaining the skin’s natural ph and providing sun protection. It balances the skin’s water barrier and provides a protective shield against environmental factors. Fragrance free. Key ingredients: Octyl Methoxycinnamate, Benzophenone-3, Parasol 1789. Agera Rx Ultimate Retinol Rejuvenator 35 is one of the most significant advances in the fight against ageing - a combination of Agera® Rx Bioemulsion Delivery Technology, Retinol and Growth Factor Peptides exclusive to Agera® Rx. Specially formulated Retinol with low irritation potential delivered in time-released minute particles (bioemulsion) deep into the skin. Retinol with its scientifically proven epidermal proliferation and skin smoothing effects reduces fine lines and wrinkles. Growth Factor Peptides, the first in a new generation of laboratory proven peptides to simulate skin cell production and collagen and elastin levels. Clinical testing has shown significant increases in epidermal thickness and dermal density. The skin will show a reduction in fine lines and wrinkles with a general more youthful appearance. Ideal For: mature and aged skin. Travel size!